U.S. Secretary of State Mike Pompeo speaks to reporters following two days of meetings with a North Korean senior ruling party official, before departing Pyongyang, North Korea, on Saturday. Pompeo did not meet with North Korean leader Kim Jong Un. Following Pompeo's remarks before departing Pyongyang, North Korea's foreign ministry said the talks with Pompeo were "regrettable" and accused the U.S. of making unilateral demands for denuclearization, The Associated Press reports. "We expected that the U.S. side would come with productive measures conducive to building trust in line with the spirit of the North-U.S. summit and [we] considered providing something that would correspond to them," an unnamed foreign ministry spokesman said, according to the South Korean news agency Yonhap. "The U.S. just came out with such unilateral and robber-like denuclearization demands as [complete, verifiable and irreversible denuclearization], declaration and verification that go against the spirit of the North-U.S. summit meeting." But Pompeo had said that his conversations with senior North Korean official Kim Yong Chol were "productive" and that he had made progress "on almost all of the central issues." U.S. State Department spokeswoman Heather Nauert said Pompeo did not meet with North Korean leader Kim Jong Un, as he has done on two previous visits to North Korea this year. 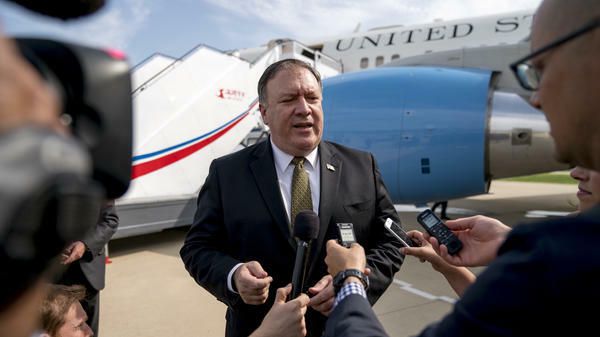 Pompeo said Defense Department officials will meet with North Korean officials on July 12 at the Demilitarized Zone to discuss the repatriation of remains, which North Korea committed to last month. He also said that working level talks will begin soon on the destruction of a missile-engine testing facility. When asked about reports that North Korea is building up sites tied to its nuclear weapons program, Pompeo insisted that Kim Jong Un is "still committed" to complete denuclearization. "We talked about what the North Koreans are continuing to do and how it's the case that we can get our arms around achieving what Chairman Kim and President Trump both agreed to, which is the complete denuclearization of North Korea," Pompeo said. Following the agreement signed at the Singapore summit, it appears that again North Korea and the U.S. have only committed to broad strokes and say that now the hard work is beginning, NPR's Seoul correspondent Elise Hu tells Weekend Edition Saturday. Before this trip, Pompeo said he was hoping to "fill in" some of the details on what North Korea committed to at the summit. Kim Yong Chol said earlier Saturday that he and Pompeo conducted "very serious discussions on very important matters yesterday" but later added that "there are things that I have to clarify." Pompeo responded, "There are things that I have to clarify as well." Neither side disclosed those details. The Trump administration has said it would take between 1 and 2 1/2 years to dismantle North Korea's nuclear program. But many nuclear and policy experts say it would take several years to denuclearize the Korean Peninsula, if not decades. "No, it cannot be done in one year. It's a very, very unrealistic plan," Sue Mi Terry, Korea an analyst for the Center for Strategic and International Studies and former CIA analyst, told Morning Edition on Friday, adding that just the process of verifying the full scope of North Korea's nuclear program "takes years, decades."